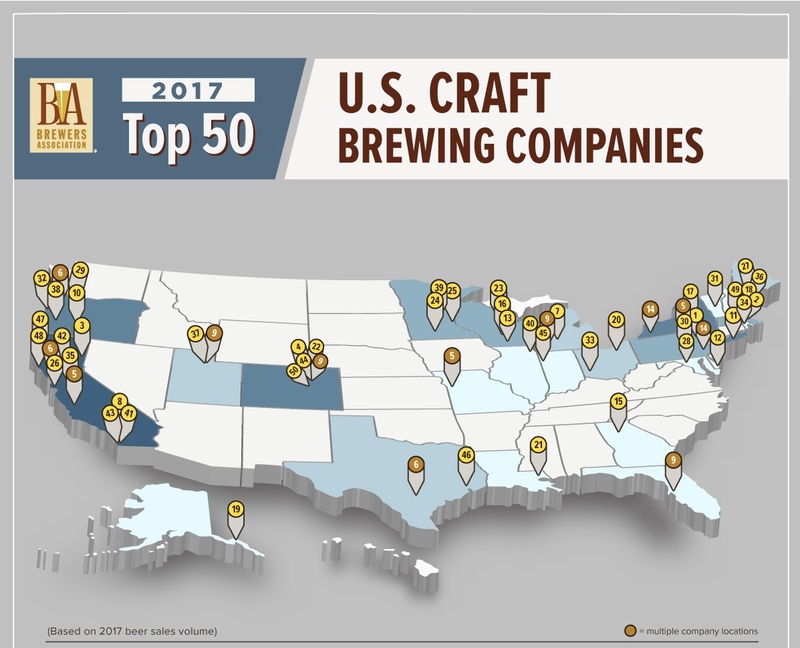 The Brewers Association today released its annual rankings of the top 50 U.S. beer companies based on 2017 sales volume estimates. Amongst BA-defined craft beer producers – companies that make fewer than 6 million barrels annually and are less than 25 percent owned by an alcohol industry member that is not also a craft brewery – Pennsylvania’s D.G Yuengling & Son once again topped the list. Boston Beer Company ranked second, while Sierra Nevada Brewing, New Belgium Brewing and Duvel Moortgat — which comprises Boulevard Brewing, Firestone Walker and Brewery Ommegang in the U.S — rounded out the top five. Duvel actually moved up one spot on the list, ahead of Texas’ Gambrinus Company, which owns the Shiner, Bridgeport, and Trumer brands and fell to sixth. Although still ranking among the top 10 craft beer companies, Oregon’s Deschutes Brewery fell two places, to tenth, while Stone Brewing Company and Canarchy – Oskar Blues, Cigar City, Perrin Brewing and the Utah Brewers Cooperative – each moved up one place, to eighth and ninth, respectively. Pennsylvania’s Tröegs climbed eight spots, and now ranks as the 30th largest BA-defined craft beer company in the U.S.
Chicago’s Revolution Brewing, which first cracked the top 50 in 2015, moved up six more places, to No. 40 on the list. Meanwhile, fast-growing Cincinnati startup Rhinegeist made the top 50 list for the first time, ranking 33rd ahead of some notable craft beer makers, including Maine’s Allagash Brewing, Minnesota’s Surly Brewing and Ninkasi Brewing. 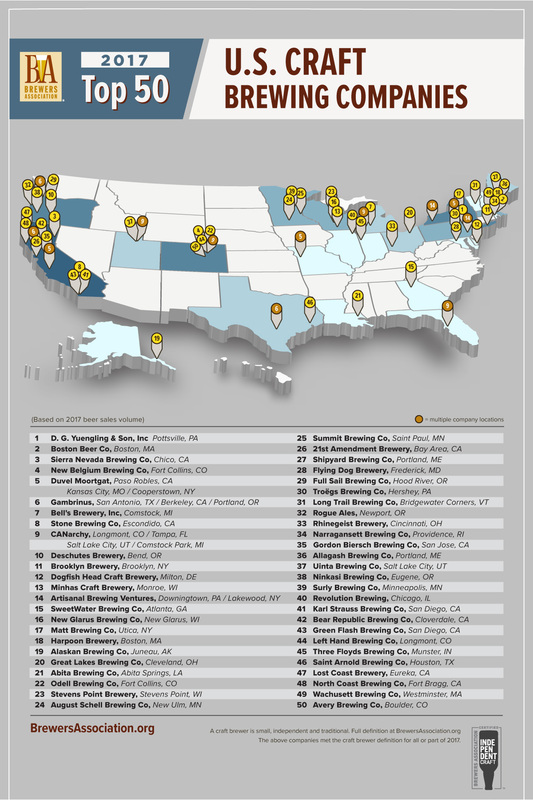 Speaking of Ninkasi, the Oregon-based company fell five places to 38th. And San Diego’s Green Flash Brewing, which recently pulled distribution from 32 states and began a recapitalization process, also fell six places, to No. 43. You can check out the full rankings here. Official production estimates will be published in the May/June issue of The New Brewer magazine. Additional information is also included in the press release, below. “In an increasingly competitive and mature marketplace, these brewing companies continue to lead and pave the path for small and independent craft brewers,” said Bart Watson, chief economist, Brewers Association. For a complete list of brewing company brands, please visit BrewersAssociation.org. A comprehensive State of the Industry report will be delivered during the 2018 Craft Brewers Conference, held from April 30 – May 3, 2018 in Nashville, Tennessee. The association’s full 2017 industry analysis, which shows regional trends and sales by individual breweries, will be published in the May/June issue of The New Brewer, available in May 2018. 1 Figure based on companies that met craft brewer definition for all or part of 2017. An American craft brewer is small, independent and traditional. Small: Annual production of 6 million barrels of beer or less (approximately 3 percent of U.S. annual sales). Beer production is attributed to the rules of alternating proprietorships. Independent: Less than 25 percent of the craft brewery is owned or controlled (or equivalent economic interest) by an alcoholic beverage industry member that is not itself a craft brewer. Traditional: A brewer that has a majority of its total beverage alcohol volume in beers whose flavor derives from traditional or innovative brewing ingredients and their fermentation. Flavored malt beverages (FMBs) are not considered beers.